This course is for those who have taken the Part 135 Initial Pilot Training course. Alternate this course with Part 135 Recurrency A for your annual recurrent training requirement. 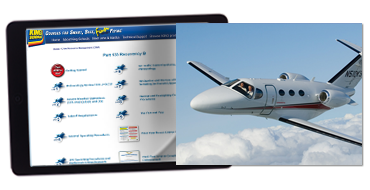 This course is a stand-alone course that fits into your Part 135 training package—and greatly reduces your workload by providing your pilots with a thorough review of the general knowledge topics required in FAR 135.345. Satisfies IS-BAO recurrent training requirements. Your Chief Pilot can keep tabs on each pilot's progress with our Course Completion Status Report. And when your pilots complete the course, they'll receive a course completion certificate and logbook endorsement. Your pilots will also receive downloadable Cockpit Reference Cards (choose On-Demand and/or Commuter Operations) to remind them of critical flight and duty time limitations, takeoff and landing requirements, and IFR lost comm procedures.